Mario Balotelli has a reputation for being both unpredictable on and off the football pitch, none more so than in his time spent with Liverpool FC. But it seems he may have finally found his feet, albeit on the factory floor at the UK headquarters of global hardware giant Caldwell. 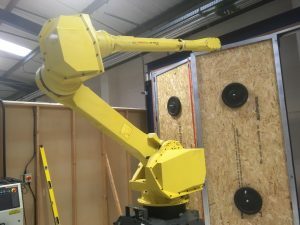 The Coventry-based firm have named their new robotic bi-fold testing facility after the precocious footballer; and it is believed that the facility is the only one of its kind in the UK. Tim Ferkin, Director of Sales and Marketing at Caldwell, comments: “We have launched a robotic bi-fold testing centre which tests the strength and durability of bi-folding doors and their hardware. It’s been a huge investment of time and money for us and has taken months to get off the ground. Housed in Caldwell’s new on-site, dedicated bi-fold door testing facility, Balotelli tests every aspect of a bi-fold door including the sliding mechanisms and operation of the handles. The investment was made as part of Caldwell’s R&D investment programme, which has seen the company invest around £1m over two years in its operations and products, and it is soon to roll out even more UK firsts in the coming weeks. It also comes at a time when Caldwell is ramping up its bi-fold hardware production, working with some of the leading bi-fold door manufacturers to produce new and improved hardware. Caldwell UK is part of the Caldwell Group, a world leader in the design and manufacture of bespoke hardware. For more information please call 024 7643 7900 or send us an message.